Ever heard of rhytiphobia? Me either. It's the fear of getting wrinkles for heaven's sake, and there were a few other phobias I'd not heard of, but experienced to a degree, that I read about here. 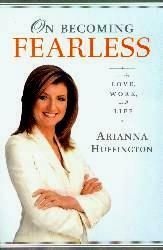 Arianna Huffington's latest book is about women and their fears and overcoming them, or at least recognizing and dealing with them. For many, their fears can be debilitating while for others, they may seem mild. Be it fear of public speaking, fear of being alone, fear of failure, fear of gaining weight, fear of losing, whatever, if you don't get a grip on it, it can take over your life. Ms. Huffington says, "Since fear is such a primal reaction, making the choice to move forward despite fear is an evolved decision that transcends our animal nature". Lovely, isn't it? And, "If we can find that greater inner freedom and strength, then we can evolve from a fearful state of living to a state of freedom, trust, and happiness". And, "Since the comparison game is a game that no one can win, why play in the first place?" Good question. Though we're evolved, there are still so many things we've clung to. Women especially. This book will help you spot your fears and show you how you can deal with them, and there are stories of fearlessness by Sherry Lansing, Nora Ephron, and Diane Keaton among others. Ms. Huffington offers snippets of her own experiences with fear, which are common in many women (see how many you have), and once you say your fears out loud, you can begin working at controlling and eliminating them. Also, remember the mind is extremely powerful, and if you can "mind over matter" your thinking, you're going to be able to overcome (or at least control) many of your fears. Thankfully, I might be alone but I'm not lonely - one of the worst fears women have. Don't let fear hold you back. Visit the Huffington Post website at www.huffingtonpost.com. Conclusion - Extremely uplifting and full of encouragement, especially the final chapter.